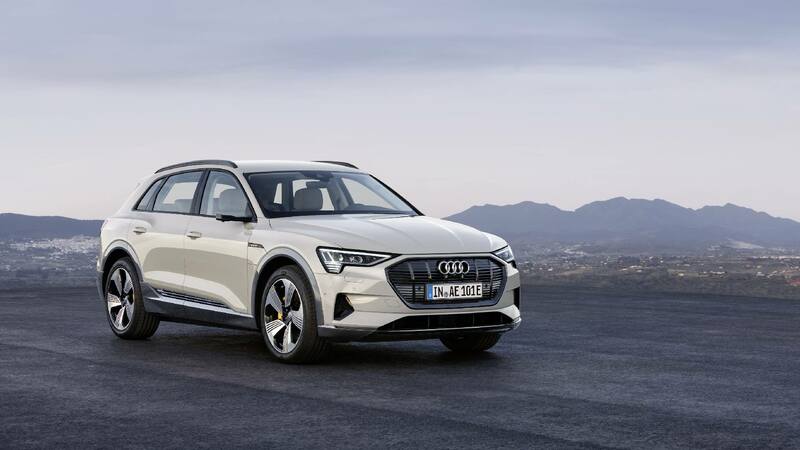 Audi finally unveiled it’s new e-tron SUV. 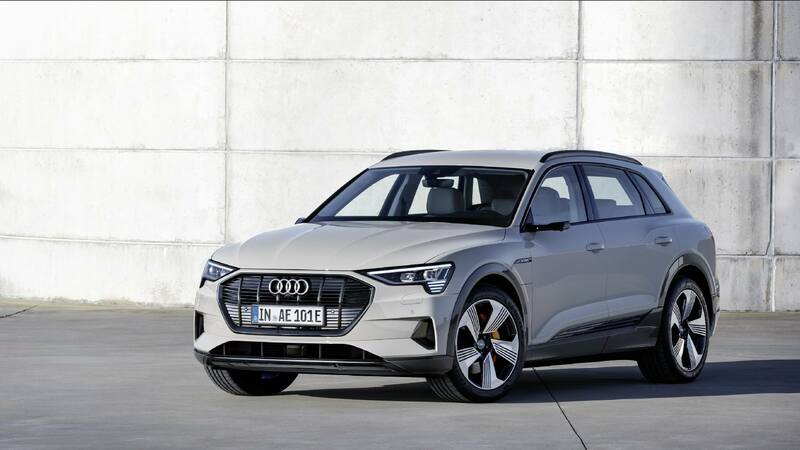 The new 2019 e-tron is a very important and very large next step in Audi’s product plan. Indeed, Audi predicts that by 2025, one in every three Audi’s sold will be electric. 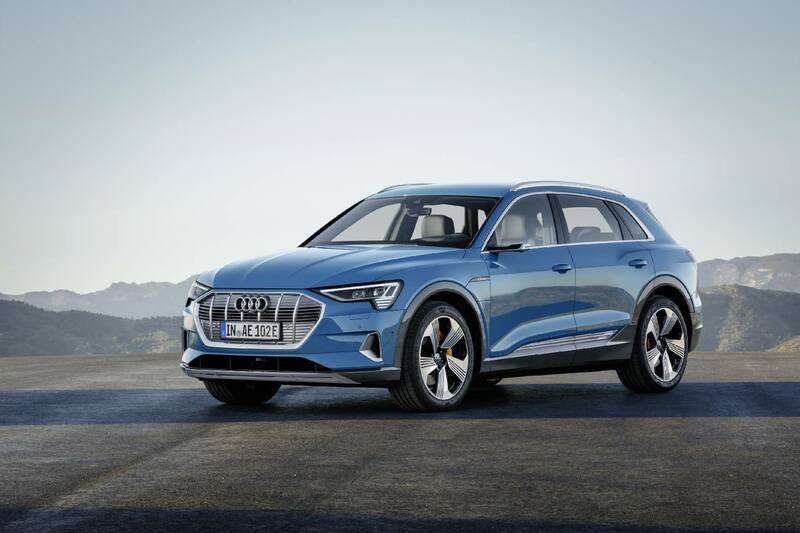 If that seems too optimistic, misguided, or just plain unworkable to you, Audi is insistent that electric vehicles are the future and they hope to have an electric version of every car they sell someday very soon. Not only are they planning to produce a fleet of EV’s alongside their regular line-up, they’re also investing heavily in charging technologies and helping organize and standardize charging networks across both Europe and the United States. The day of the event, we were all invited to the Audi “Tech Park” at the Bill Graham Civic Auditorium in the heart of San Francisco. There were several seminars being held regarding the e-tron. Some were technological, some were marketing and design oriented, some were product planning oriented. There were round table discussions and interviews being held. Even though they refused to reveal the look of the e-tron or it’s interior, many of the e-tron’s technical features were on display. 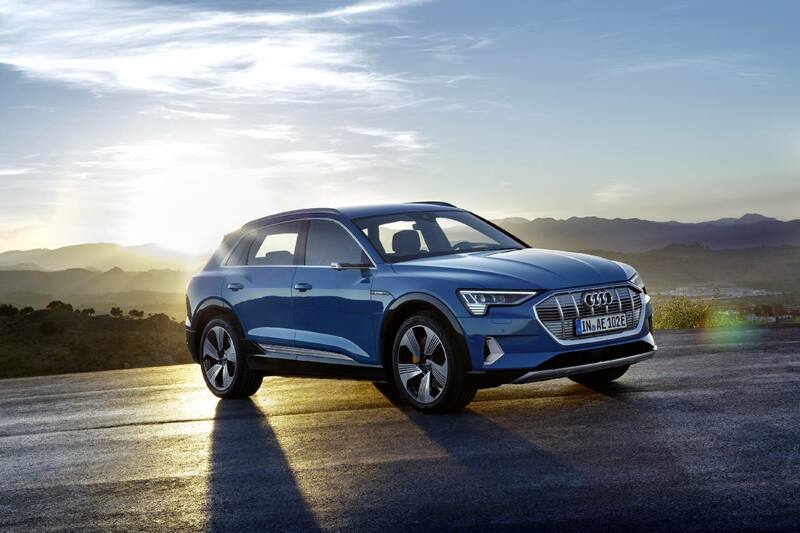 There were cut-away displays, static displays, and virtual holographic walk-throughs of many of the facets of the e-tron’s impressive technical componentry and engineering accomplishments. Regarding the virtual holographic walk-throughs, let me just say that it’s quite humorous to walk past a group of people wearing VR headsets, all staring at empty space, nodding their heads in understanding. It takes on a whole new twist when the lecturer adjusts switches in mid air that only he can see, and everyone again nods in understanding. In the evening, Audi shuttled it’s guests down to the waterfront where they were invited on board a four-deck paddle wheeler for dinner and drinks while the boat slowly cruised away from the wharf area up the bay past the Golden Gate Bridge and Alcatraz at sunset to another wharf on the north end of the bay. The destination was an old Ford manufacturing plant that dates back to World War II and as we approached, bright blue lights lit up around the plant and dance music started playing. As if that wasn’t enough, nearly one-hundered drones suddenly rose up from the grounds around the plant, lit bright blue, and swarmed above the plant like a cloud of gnats. They hovered and swarmed in a cloud before swirling around and around in a tornado shape before flattening into a horizontal circle and then separating into four separate circles that then rose vertically and positioned themselves in the sky as the Audi logo: four interconnected rings. The crowd of guests on the boat went wild. Then the old Ford plant was illuminated in the evening darkness in circuit board designs projected onto the building to the heavy pulse of dance music. 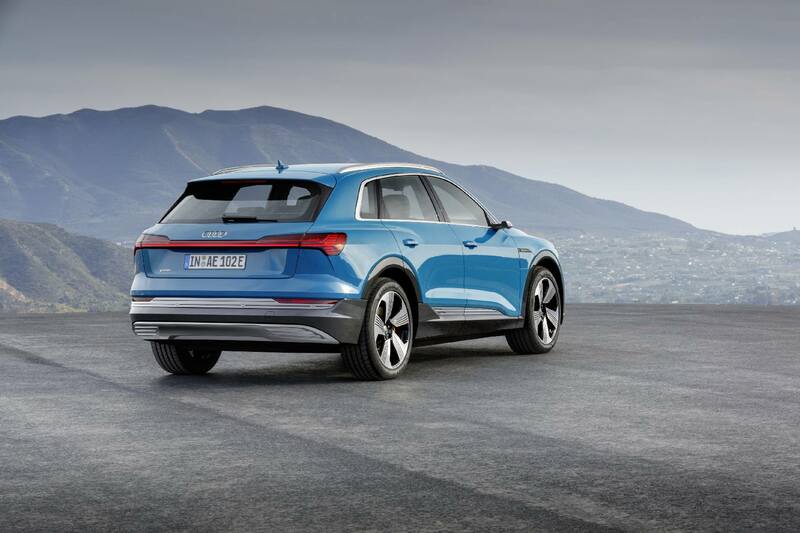 After the boat docked, everyone was ushered into the plant for the The Charge – the long-awaited unveiling of the Audi e-tron and Audi’s EV plan for the future. Once a few speeches were given, everyone was invited to check out the e-tron up close. 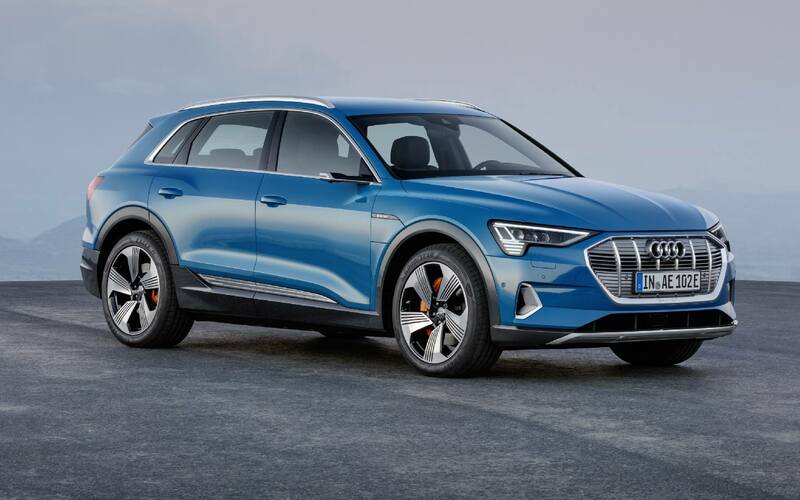 At long last, we were allowed to see the e-tron undisguised, both inside and out. The e-tron’s exterior design is solid Audi. It shares a lot of it’s overall shape with the Q5 and Q7 but the details are unique and many of the details are designed to aid efficiency to improve the mileage that is so important in an purely electric car. Because the grill no longer needs to direct cool air through a radiator, it’s solid and the slipstream flows over it rather than through it, reducing drag. When sensors indicate that drivetrain components need to be cooled, louvers in the front grill open and allow air to swirl through. They close again once the drivetrain components have cooled to an acceptable level. The side air inlets on the front bumper are there to direct air through passages to exit just inside the wheel wells. This air flows out of the wheelwell and across the face of the wheel, reducing the slipstream drag and increasing efficiency as well. Also unique are the side mirrors, which are thin wings that hold a rearward facing video camera. The camera image is displayed inside the e-tron in a triangular corner screen where the door meets the dashboard. This option will be immediately available in Europe and China but not in the US, where prehistoric rules prohibit them. Audi is currently lobbying the U.S. government to allow them as they’ll increase mileage and, really, it’s the way industry technology is heading. It may take a few years for the dinosaurs at the federal government to come around. 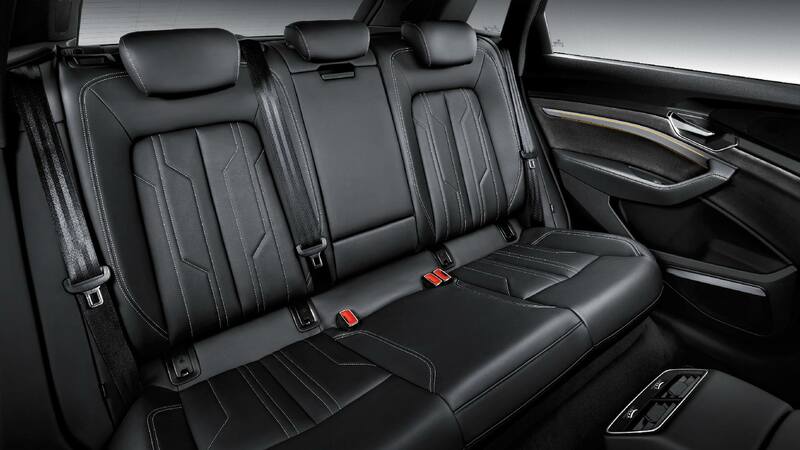 Inside, the interior is again solid Audi, yet it’s new and different. Most noticeable is the airy center console that is open on the top and on the side, giving the interior a light and airy feel. 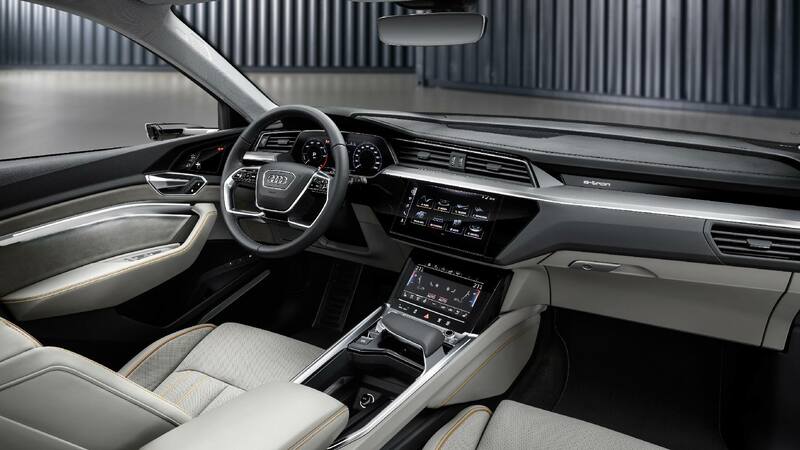 There are two MMI digital touch screens in the center stack, a 10.1” upper one that controls infotainment, telephone, navigation, and particular e-tron settings; and an 8.6” lower one, that allows the driver or passenger to control heating, cooling, and texting options. A jeweled shifter lever doubles as an wrist-rest for the driver to utilize when using the lower touch screen. In short, the e-tron is everything you’d expect from Audi. 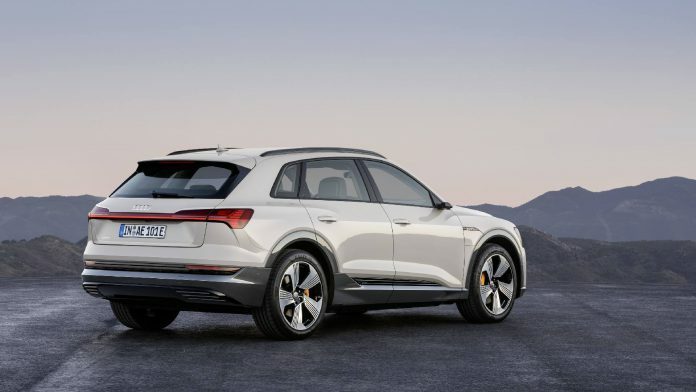 The quality, the vision, the reliability, and the dedication to the EV’s future all indicate that Audi is very serious about the e-tron being a major part of their future. Frankly, we think Tesla is in for a rough time now that serious competition is coming from the likes of Audi, Jaguar, and soon Mercedes-Benz. 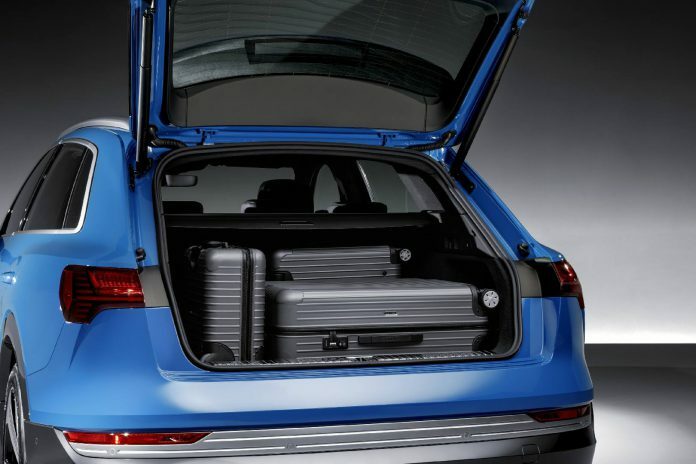 Technologically, the large battery unit in the floor of the e-tron is the heart of the car. It measures 2.28 meters (7.5’) long, 1.63 meters (5.3’) wide, and 34 cm (13.4”) high. It’s comprised of 36 shoebox-sized Li+ battery units all hooked together and integrally cooled. It operates with a voltage of 396v and stores 95kW of energy, roughly enough to provide range to travel more than 400 km (250 miles) along with it’s innovative energy recuperation methods. Audi has managed to speed up the recharging by use of a 150kW charger. Previously 125kW was the fastest charger available. Audi is rightly proud of this faster charging system and is working to improve it even more, working to achieve 200kW charging down the road. With a 150kW charger, a complete charge from 0kW takes about a half-hour. It this seems long to you, consider that most internal combustion engine fuel stops take 7-10 minutes to fill the tank. Fuel stations across Europe estimated that an average fill-up stop actually takes 25-30 minutes by the time the patron has paid, bought snacks, and used the bathroom. 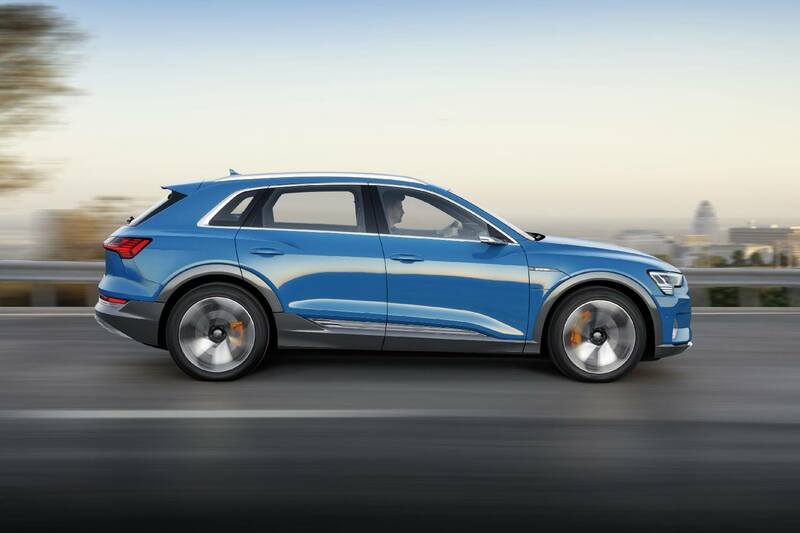 So 30 minutes per stop being the average, Audi is comfortable with a 30-minute charge time. 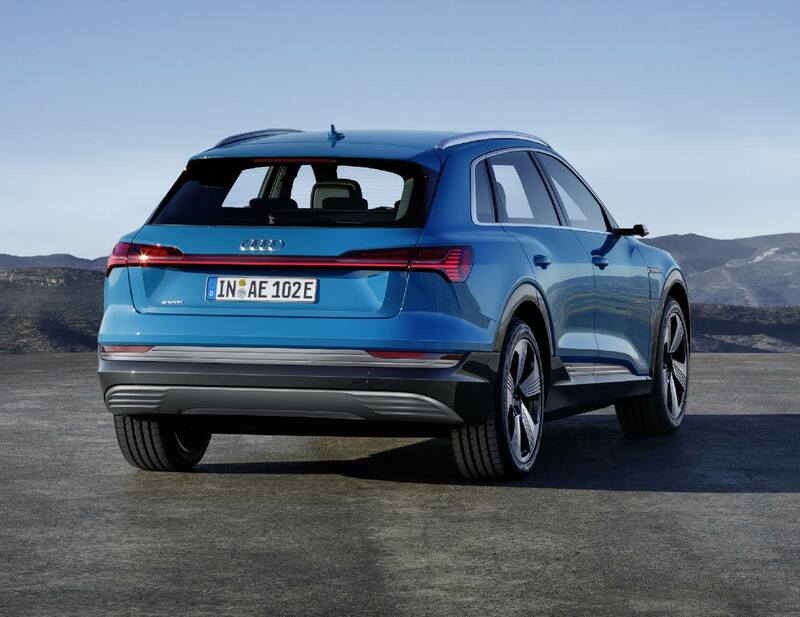 Of course, most customers surveyed want a 10-12 minute recharge time and Audi is working to achieve that in the near future. Of course, building an EV that works well and charges quickly is only half the battle. There are infrastructure challenges to widespread EV usage too that Audi is investing heavily in to overcome. Having ample charging stations is one problem. Across Europe, there are currently 80,000 commercial charging ports operated by over 70 different unaffiliated operators. A joint venture between such companies as Audi, BMW, Ford, Mercedes-Benz, and others has been developed to organize them. Called Ionity, the organization is working to integrate as many of the charging ports into one network as possible. So far they have 72,000 of the charging points in their network and they’re working to make it simpler to charge your EV and simpler and easier to pay for it. In the United States, a similar group called Electrify America is working to install a network of charging stations to support the growing EV industry. They’re currently working to install over 500 150kW chargers in the first phase of their plan, teaming up with popular fuel station chains as well as familiar grocery chains such as Walmart to make charging stations available across the whole country. Since 2010, they’ve gone from 500 charging stations to over 60,000 charging stations. Now they’re working to install even more. And more of the faster 150kW chargers. 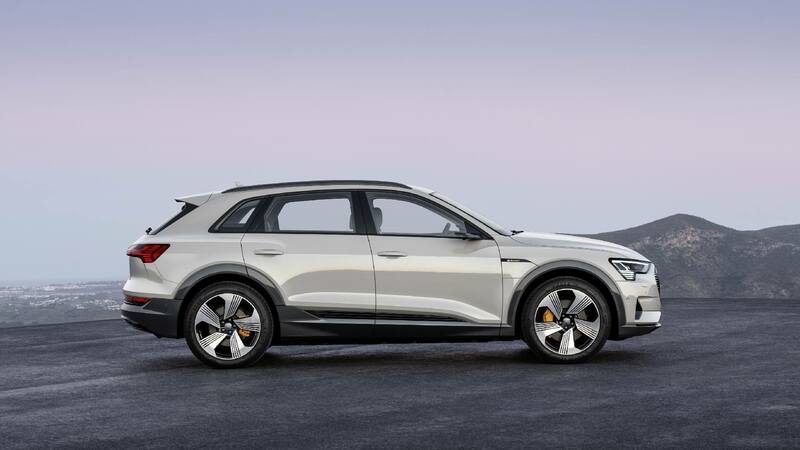 Additionally, all e-tron owners will get 1,000kW’s of free energy over four years. That’s roughly enough to travel roughly 2,000 miles. Even more interesting, Audi is working with a company called Arcadia Power. They’ll let you buy a solar panel in their power grid and you’ll receive credit for the power your panel adds to the grid and further reduce your charging costs. 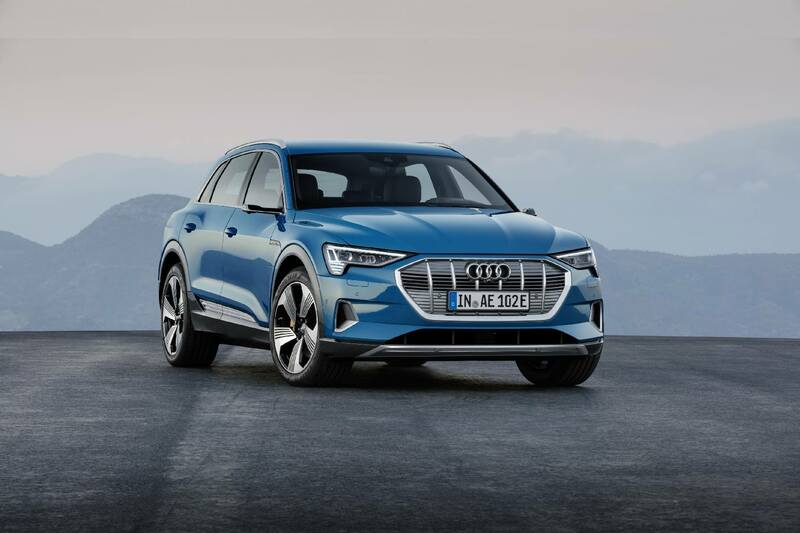 Audi is also teaming up with Amazon’s Home Services division to make it easy and affordable for American e-tron purchasers to purchase and have a 240v home charger installed right in your home. You can also use your Amazon Alexa to control various aspects of your e-tron, for example pre-heating it on cold days. To start, there will be three trim packages. 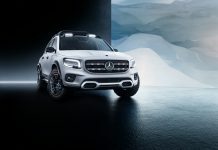 The Premium Plus model will start at $74,800 in the US and will come standard with heated and ventilated seats and LED Matrix headlamps. 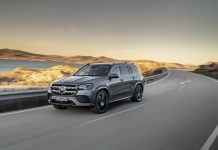 It will offer a driver assistance package, a towing package, and a cold weather package. The Prestige model starts at $81,800 and offers the driver’s assist package, massage front seats, heads-up display, and air ionizers and fragrancing. 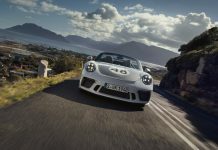 Offered in the first year only is the special Edition One trim, limited to 999 units and priced at $86,700. 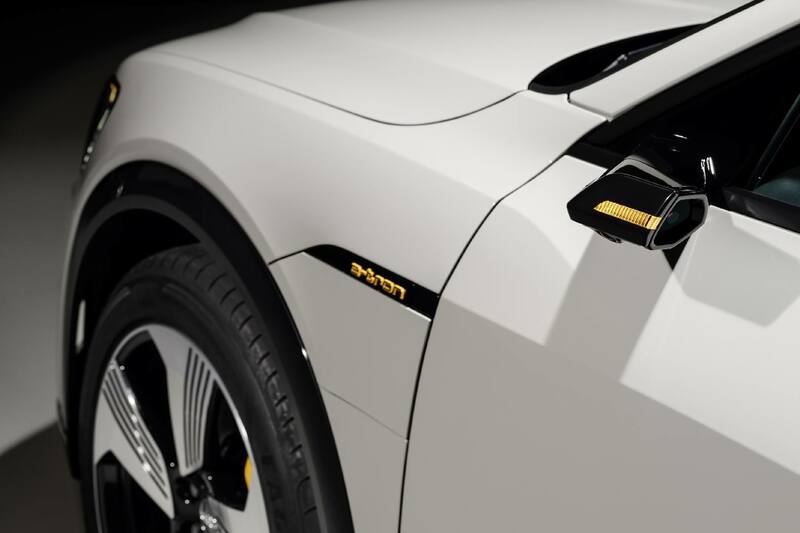 Building off the Prestige trim level, it comes in the unique Daytona Gray metallic paint and offers special puddle lighting and night vision assist, aluminum exterior trim, and “high-voltage orange” brake calipers. 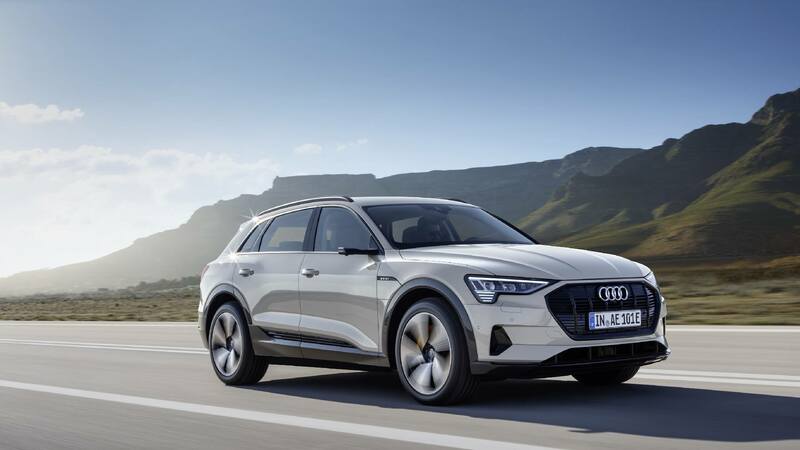 The e-tron will start being delivered in Europe in the last quarter of 2018. 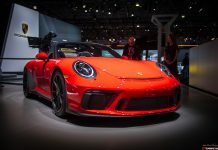 US deliveries are anticipated to be in the second quarter of 2019.